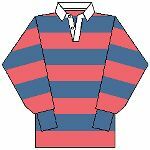 The original 19th century colours of the Petersham RUFC are described as “Bismarck and Coral, 4 in. bars”. While it is difficult now to say exactly what these colours might have been, the strip probably looked something like this. 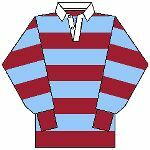 These colours were used from the club’s inception in 1883 up until the disbanding of the Metropolitan Rugby Union Borough Competition at the end of 1907. After the war the club reformed and played initially in Dark Green. This strip was eventually overshadowed by the famous Myrtle Green of Randwick however, and so when Petersham joined the newly formed New South Wales Rugby Union Non-District Competition in 1929, the colours were changed to the modern “Sky Blue and Maroon, 4 in. bars” in deference to the playing colours of the New South Wales and Queensland Rugby Unions. Nearly eight decades and three Kentwell Cup premierships later, the only other change has been the addition of the famous Waratah crest of New South Wales, emblazoned with the club’s founding date of 1883. With so much history behind it, the grand old Petersham jumper is a great source of pride and passion to our players, and has motivated more than one stirring victory against the odds. May there be many more! Petersham RUFC was established in 1883, and is Australia's original and oldest "Subbies" rugby club. We train every Tuesday and Thursday night from 6.30pm at our home ground, Camperdown Oval.